AUMC volunteers assemble meal packages for students' families. Lower-income families in the Annandale Terrace community have enough food to get through the weekend, thanks to a group of dedicated volunteers from Annandale United Methodist Church. Eighty-one percent of the students at Annandale Terrace Elementary School are eligible for free or reduced-price lunches. For many years various charities, community groups, and church members have provided “power packs” full of snacks sent home in the backpacks of lower-income K-3 students on Fridays, says Betsy Clevenger, the volunteer organizer of the Annandale Terrace program. Two years ago, Fairfax County Public Schools social worker Jane Thatcher asked Clevenger if AUMC could expand the power pack program to grades 4-5 and add items for weekend family meals. The Children’s Ministry Lenten Mission Project at AUMC agreed to support the program. The family packs include things like a box of spaghetti, a can of pasta sauce, a can of tuna, diced tomatoes, chicken, soup, rice, dried beans, and fruit. Annandale Terrace Principal Andrea Garris and English-as-a-second-language teacher Laura Higdon identified the students. The packs are sent to the schools, and teachers put them in backpacks discreetly, so classmates don’t know who is getting them. A staff member provides cooking instructions in Spanish if needed. Another group of AUMC members, along with volunteers from other churches, provides dinner to 350 students in the after-school program at Poe Middle School. 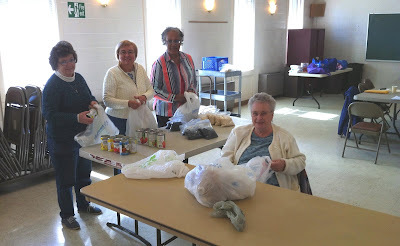 I know that these amazing volunteers are always looking for food donations and support. The kids greatly appreciate the food and look forward to the food each week. Thank you Betsy and your wonderful team for all your hard work. Yes, Betsy does a wonderful job spearheading this and other efforts at AUMC. Kudos to all the volunteers there.